Two new pairs of epimeric pyrrolizidine alkaloids, nervosine XVI/XVII and XVIII/XIX were isolated from the whole plant of Liparis nervosa. Their structures were elucidated by extensive spectroscopic analyses including 1D, 2D NMR, and HR-ESI-MS. Published in Khimiya Prirodnykh Soedinenii, No. 2, March–April, 2019, pp. 262–264. 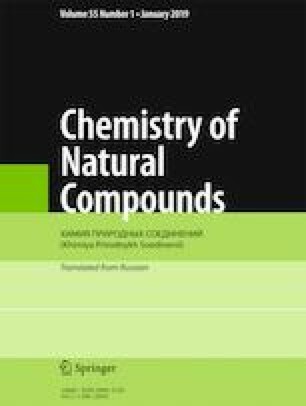 This work was supported by the National Natural Science Foundation of China under grants (81402803 and 21807089), the Research Foundation for Educational Commission of Sichuan Province (15TD0048), the Opening Project of Chemical Synthesis and Pollution Control Key Laboratory of Sichuan Province (CSPC 201801).